The cinematic partnership of San Jose film editor/composer John Ottman and director Bryan Singer has continued for more than a decade; Singer's perspective as an intelligent outsider raised the IQ of the superhero film for keeps in the first two X-Men movies and now in Superman Returns. Ottman's skillful editing and his command of the anatomy of the movie score helped make the X-Men artistic successes as well as hits. Ottman, raised in San Jose, talks about Superman Returns, and the strain of worrying about tampering with a beloved series. METRO: There's a lot about Superman Returns that I loved; your score, the plane sequence, the deliberately 1970s-style computer graphics on the titles. OTTMAN: Those titles were our first attempt to tell the audience that we weren't trying to pervert the series. METRO: Did you talk to John Williams about the score you adapted? OTTMAN: We had a 10-second conversation about six months before we started. I don't think he understood what I was truly about, here. Later on, he called Warner Bros. to offer his help, and he said he'd retrieve his original score notation if we wanted it. METRO: I've been rolling over that theme music in my mind—the theme is a little like the "William Tell Overture," with the alpenhorns, and a little like "Also Sprach Zarathrusta." OTTMAN: It's called "Return to Krypton," and I'm sure the 1979 film was scored to that exact piece, Zarathustra, during the rough cut. METRO: It sounded like you added an organ to the beginning. OTTMAN: It's a choir—it gives the sense of an organ. METRO: This is the sort of thing that's impossible to work into an article, but the various "Superman Marches" are very similar pieces of music, between the Fleischer Brothers theme—written by either Winston Sharples or Sammy Timberg; Leon Klatzkin's theme from the 1950s TV show or Williams' march in the second part of the Superman theme. Maybe it's the limitations of military music that makes them sound similar—"military music is to music what military justice is to justice." OTTMAN: I don't know about that, but I think Williams was trying to honor the TV show theme. Rather than write new music that would water an old theme down, I thought we'd preserve the '70s music. METRO: I noticed they almost used the original Superman score in the three sequels, even though composers like Alexander Courage and Giorgio Moroder had credits. OTTMAN: The music in the last two films was a joke; they were not even cut to the picture's cues, which was part of Superman III and IV's cheesiness. They'd have scenes in Metropolis with background music from a theme for a trial on Krypton. METRO: Here's a ridiculous geek question: there's a Mozart piece played aboard Lex Luthor's yacht—is that a reference to where the piece is also used, on a yacht scene in The Spy Who Loved Me where a yachting Bond villain Stromberg (Curt Jurgens) feeds an underling to the sharks? OTTMAN: To tell you the truth, I can play that piece, but I don't remember what it's called. I was in Australia working on the film, and I had to hum it into a tape recorder for my music editor, and she had to go take it to a classical music store because I was so busy. METRO: Do you remember seeing the original 1979 Superman in San Jose? OTTMAN: Of course! It was a big moment. It was at this big theater down by Branham Lane—I can't remember the name, even though I can just see in my mind's eye, the seat in front of me. * It wasn't one of the Century Domes, because I can remember the screen wasn't curved. I didn't beat my record of seeing The Empire Strikes Back 13 times at the Century 22, but it was close to that number. METRO: What was your first reaction to the news you'd be working on Superman Returns? OTTMAN: I was completely puzzled. "Why?" was my feeling. I was ready to go on to X-Men III, and I had all my themes ready for that one. Learning about Superman Returns I felt a weight descend on my shoulders that didn't lift until it was done. I didn't think we could win; the thought of John Williams' theme music practically crippled me. Everyone had similar pressure on them; they were stepping into someone else shoes: Bryan into Richard Donner's shoes, Brandon into Christopher Reeve's shoes, even the production designer ... We were all asking ourselves "What are we doing?" METRO: How is editing different now that when you started out? OTTMAN: You don't have to work with your arms as much. When I began, it was on flatbed editor with platters of film. Now it's done on a computer. It's great not having to splice with every cut. Sometimes, I find that editors that didn't come up from the old way of doing it lack the discipline of making a choice. Sitting down and wanting six different views can sometimes mean a lack of POV to begin with. 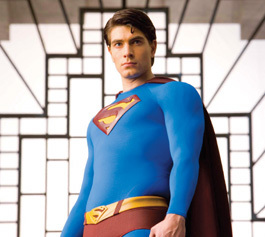 METRO: What's your favorite work of editing in Superman Returns? OTTMAN: It's not what you'd expect. It's the scene of Kevin Spacey talking to Lois Lane. ... There were different takes of him during the scene, of Lex being evil, goofy, out to lunch. ... The take we used of him shouting "Wrong answer!" was cut from a version where Kevin was raging all the way through the exposition of his plans. Also the scene of Kitty (Parker Posey) being unimpressed by the Kryptonian crystal at the model train set was an exact take we used twice. METRO: It's very funny. Have you seen the new X-Men and do you have any comments? OTTMAN: I didn't go see it, because I've been working on Superman Returns. I've heard everyone's reaction ... since I was hoping to build on some of my musical themes, but the music from the first two films was abandoned for the third film. There's so little musical continuity between the films, which is no slam on the composer they used. But since I've been working with John Williams' themes, I'd hoped they'd be working with mine. * I remember it, too. It was my first Christmas back from college. Me and my girlfriend Suzanne thought we could beat the crowds at Grauman's Chinese Theater if we went to the outskirts of town to see the matinee show, Christmas Eve 1979. So we went to a sixplex in Marina Del Rey and saw it on an unfeasibly tiny screen and were moist-eyed anyway. Suzanne would have been about 20, but there was enough child left in her to turn to me during the helicopter rescue and whisper, "We could use someone like him around."